The senior international basketball preparation for the European Championship is coming to its conclusion. France will host Belarus, Canada and Russia in Beauvais in their last test matches before travelling to Poland for the 2011 EuroBasket Women competition. The "Tournoi International de Picardie" will give Pierre Vincent a last chance to work on things before heading off to Katowice for the defense of France's title. Belarus and Russia are yet to confirm their final roster. So this tournament will enable the coaches, Anatoli Buyalski and Boris Sokolovsky to finalise their EuroBasket Women rosters. The Belarus training roster is as follows: Yelena Leuchanka, Natalia Marchanka, Anastasiya Verameyenka, Tatyana Troina, Yuliya Dureika, Natalia Trafimava, Natallia Anufryienka, Sviatlana Valko, Tatsiana Likhtarovich, Viktoryia Hasper, Darya Lipinskaya, Maryna Ivashchanka, Tatsiana Dashkevich, Maryia Filonchyk, Katsiaryna Snytsina, Elena Novikova, Aliaksandra Tarasava and Marina Kress. The Russian preparation was disturbed slightly with the forfeit of Epiphanny Prince. Prince who was named in the preliminary squad is currently playing basketball in the WNBA. However Svetlana Abrosimova has been appointed as the new captain. The sixteen players remaining are: Olga Arteshina, Tatiana Widmer, Evgeny Belyakov, Marina Cousin, Anna Petrakova, Maria Cherepanov, Ludmila Sapova, Natalia Myasoedova, Irina Osipova, Maria Stepanova, Svetlana Abrosimova, Elena Danilochkina, Katerina Keyru, Ilona Korstin, Catherine Ruzanova, Tatyana Popov. Canada arrived in Europe on 25 May with 12 players: Chelsea Aubry, Janelle Bekkering, Leanne Evans, Kalisha Keane, Lizanne Murphy, Krista Phillips, Courtnay Pilypaitis, Michelle Plouffe, Kim Smith, Alisha Tatham, Tamara Tatham and Shona Thorburn. 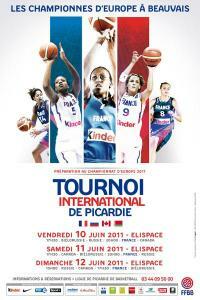 The full French EuroBasket Women roster is expected to be on duty for this event.